Fight ghosts with the 3DS camera in Majesco's new augmented reality game. Ever since Nintendo demoed the 3DS system's augmented reality features, we've impatiently waited for a full retail game to make use of it. Majesco answered the call with The Hidden, a ghost busting adventure slated to arrive this Halloween. So long as everything comes together, this could be a premier showpiece for Nintendo's handheld. The Hidden is an augmented reality game that casts you as a member of an elite squad known as G.E.I.S.T., which stands for Ghostly Entity Investigation and Strike Team. Your mission, if you choose to accept it, is to hunt apparitions that have invaded the real world using your 3DS, which doubles as a tracking device, as well as a weapon. As Majesco puts it, "the art style uses semi-transparent, ethereal forms that blend with the real world setting to deliver a convincing and interactive effect", essentially putting ghosts on the 3DS top screen. Throughout the game's 12 missions, you'll encounter six unique types of paranormal entities, as well as powerful bosses with unique abilities and weaknesses. In addition, you engage in various mini-games. Wormhole, for example, challenges you to navigate through another dimension, collecting power ups and fighting various enemies. Paranormal Elimination, meanwhile, is more seek and destroy, where you use the circle pad and gyroscope to locate and take down entities. Before heading into harm's way, though, you'll need the right equipment for the job, including the Plasmatic Disruptor and Spectral Shield. You'll even develop and unlock cutting edge weaponry along the way while gaining security clearance and plasma energy to increase your rank to become a better G.E.I.S.T. agent. 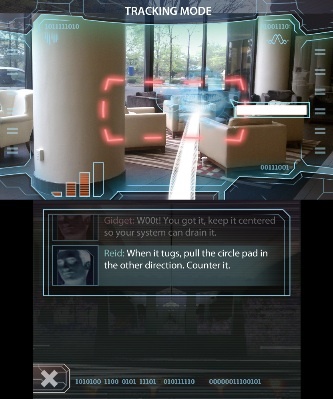 One of The Hidden's more intriguing features, though, is location based play. The game keeps a log of places visited and may ask you to return. Sure, you'll look ridiculous blasting ghosts at local restaurants, gas stations and parks, but the fate of the world is at stake. So long as Majesco invests the time and resources, The Hidden will be one of the 3DS' more intriguing games when it debuts in the fall. Most importantly, it may lead to other augmented reality titles down the road. We'll keep our fingers crossed.